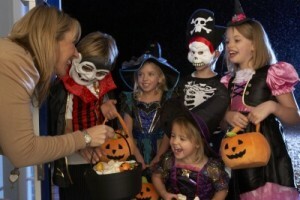 When your kids think Halloween, they’re probably thinking about candy, games, hayrides, dressing up and haunted houses. You probably think about these things too, but if you’re anything like me (five kids and all), you’re probably trying to ward off the dollar signs that pop into your head. I mean, seriously, has anyone noticed how expensive Halloween costumes have become? And in most cases, kids grow too much between years to wear their costumes a second time. Wait! There is! It’s the National Costume Swap Day. The event is exactly what it sounds like – a special event for swapping out an old, gently used costume for a new-to-you gently used costume of your choice. At some of the swaps, there will be games, rides and more. But the real idea behind the movement is to make Halloween a bit greener while, at the same time, saving some green. Featured on Good Morning America, the National Costume Swap event is giving parents, communities and even individuals a chance to do just that. Events are already organized all over the U.S. and Canada – from Los Angeles, CA to Tampa, FL, Brooklyn, NY, Toronto and Montreal. But even if there’s not a swap in your city, you or your community can still register to organize your own. You can even organize a private, person-to-person swap, if you wish.